I know you’re sick of hearing me talk about unpacking boxes and sorting and organizing. But, I’ll bet you that I’m even more sick of actually unpacking the boxes and sorting and organizing. I have good news – I AM DONE! There are still a few things left to hang on the wall and a couple of knick-knacks to place in the perfect spot, but overall, I AM DONE. And here we are – home. I’ve been thinking a lot about that word lately. I had always considered 5501 Bryan Street (our Dallas address) to be home, and the cabin was a sacred summer and holiday retreat. Our house in New Orleans has been the party pad and doesn’t really feel like home yet – I’ve never cooked a meal in the kitchen there, which to me makes a house feel more like a home than anything else. I really only go into our New Orleans kitchen to mix cocktails or to pour glasses of wine. I’m relieved to not have 5501 Bryan Street anymore (the enormous expense, the repairs it needed, and the neighbor’s constant noise pollution with their endless pursuit of perfection with their leaf blower…) but I haven’t quite grasped that the Dusty Dog is now home. 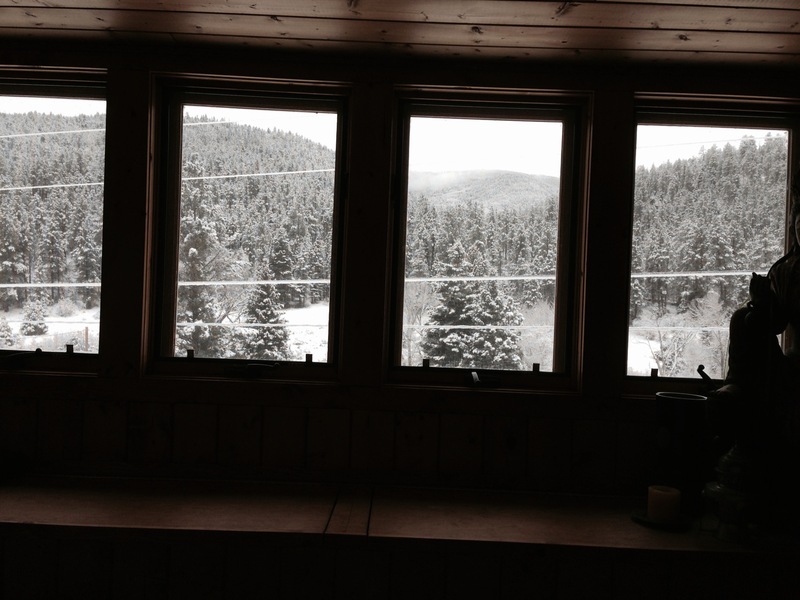 It still seems odd that there is no end date to being at the cabin looming on the horizon somewhere just past the holidays. I keep reminding myself, this is it, this is home. And in the morning, when I wake up and see the amazing view from my bed, I am in awe that this really is it. I am home. To celebrate home and being done unpacking I decided to make soup and order cable. To me, soup is one of the definitions of home and cable means football, which also defines home. We don’t watch any television at all, except for football. Really, it’s true – no television at all. On the way to the Dusty Dog, Rhonda called the cable company to get cable set up. She ended up getting mad because of their manipulative packages and cancellation fees, so she cancelled the cable before they even finished the cable installation phone call. She felt all righteous about rebelling against the cable company, and when the last two Sundays came, she was a really good sport (no pun intended) about following the game scores on her IPad. I saw a golden opportunity because on our anniversary, we had agreed not to get anything for each other since we were spending A LOT of money on beginning the restoration process on our house in New Orleans. I should know better than to believe Rhonda when she says she isn’t getting me anything for a special occasion. On the morning of our anniversary she had not one, but three beautifully wrapped Stanley Korshak boxes for me. Nothing shabby about Stanley Korshak – AT ALL! She got me a leather mini skirt that ended up being too short and reminiscent of something I wore as a cheerleader and two incredible necklaces. I was mad at myself for not getting her anything and decided the gift of football was the best thing I could give her two weeks post anniversary. 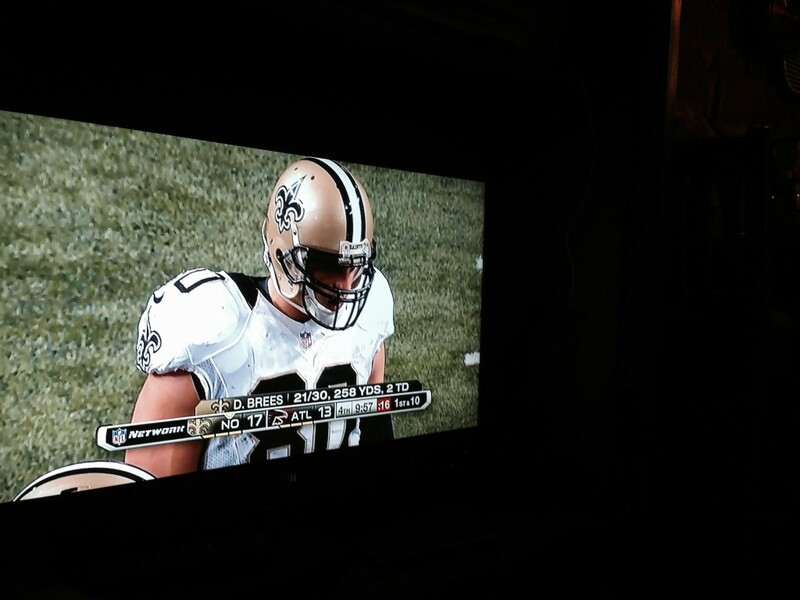 The first game we watched while eating homemade Tuscan bean soup was our beloved New Orleans Saints – Who Dat!!! 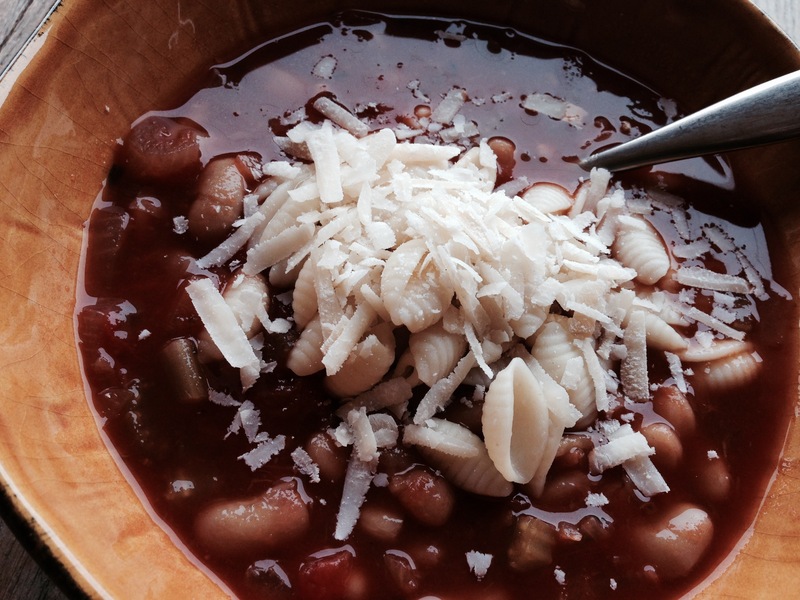 I have no idea where I got the inspiration for this Tuscan Bean Soup. About 8 years ago, I made this soup for the first time, and then several months later wanted to make it again but couldn’t remember where I got the recipe. I remembered the basic idea of the soup and improvised. This recipe is the result. It’s thick and hearty with a tangy tomato base. It’s a meal on it’s own or with a side of salad or saute’ed spinach. And it’s the perfect match for cold Fall days or the first snow of the season days. The soup worked it’s magic filling the Dusty Dog with the smell of something savory cooking on the stove – it was the perfect meal to celebrate being done with ALL THOSE BOXES, the Saints winning, and arriving home. Heat oil in the bottom of a dutch oven. Add the onion, celery, and garlic saute’ing until translucent – approximately 5 minutes. Add the tomatoes, water, bouillon, thyme, oregano, and pepper. Bring to a boil and reduce heat. Simmer for 2 to 3 hours on low. Just before serving the soup, add the beans and simmer for another 15 to 20 minutes. If you prefer a really thick soup, you can add the beans about an hour or an hour and a half before you’re ready to eat. After you’ve added the beans heat a pot of water to boiling then add your tiny pasta of choice. Cook the pasta according to the package directions. While the pasta is boiling grate the parmesan. 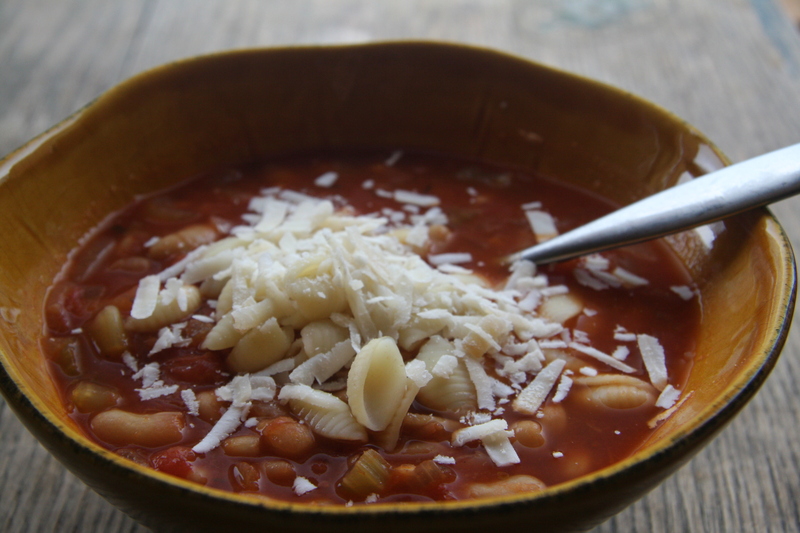 Pour the finished soup into a soup bowl, place about two tablespoons of pasta in the center and top with fresh grated parmesan. Mangia! 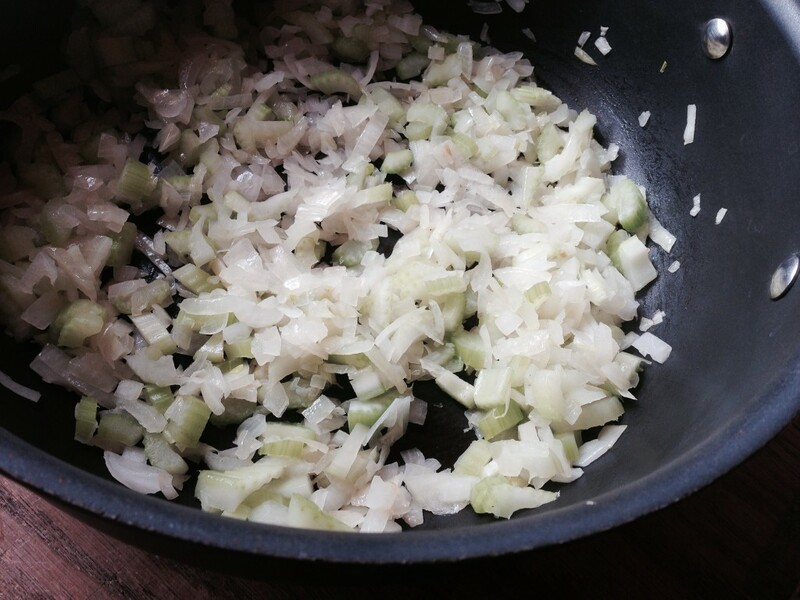 I'm a homegrown cook sharing recipes and other great stuff about food from all over the world. This entry was posted in Beans, Main Dishes, Pasta, Recipes, Soup, The Dusty Dog, Tomatoes, Uncategorized and tagged Beans, Comfort Food, Easy & Quick, Fall, Football, Home, Italian, New Orleans Saints, Parmesan, Pasta, Snow, Soup, tomatoes, Vegetables. Bookmark the permalink. I’m not surprised that you’re almost settled in. You’re a pretty efficient person! It’s feeling more and more like home Vivian! Okay, what do you do for 2 to 3 hours while simmering the soup? Does that mean you must stay in the kitchen, stirring and looking? You can’t leave home? You can’t take a walk? Plus, my stove is so hot! I’m afraid that I’d burn it! Don’t laugh, but I have trouble being this patient, but I do love soup!!!! 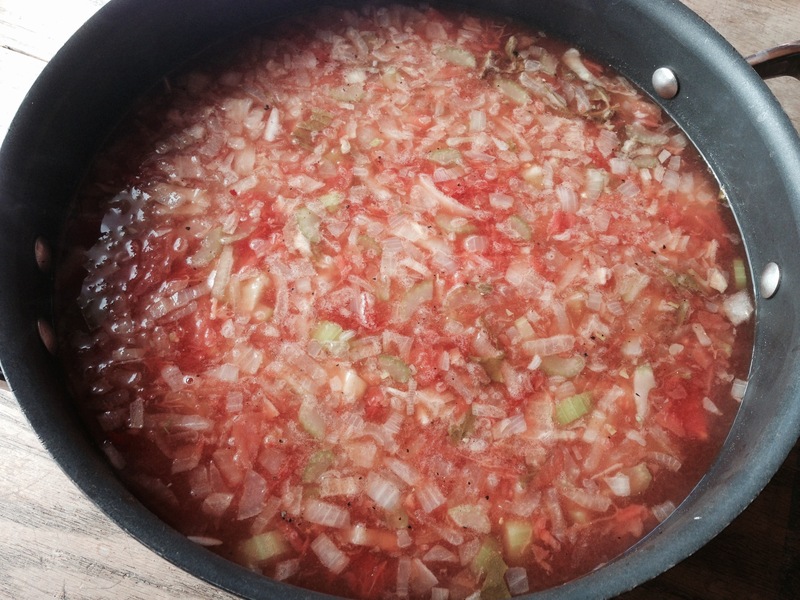 Hi Pam – you can do whatever you want while it’s simmering – just stir it occasionally. Happy early Thanksgiving! 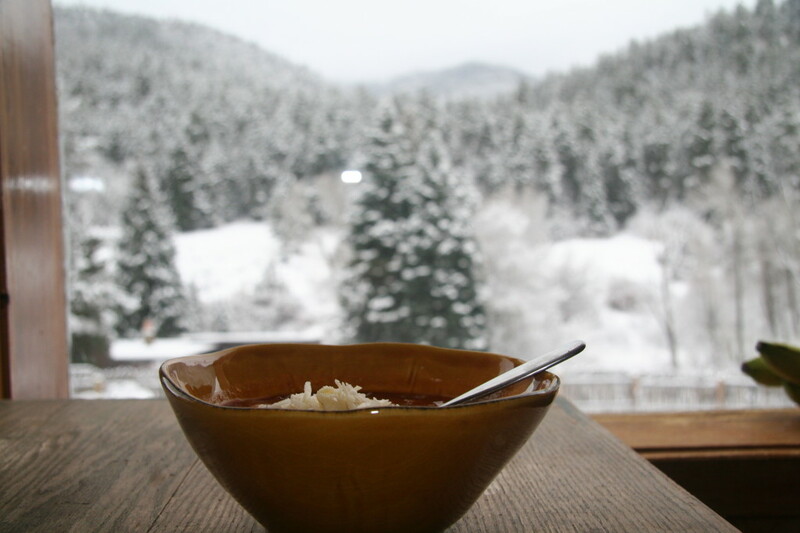 The soup has to be wonderful on this snowy day at the Dusty Dog. You know how to make a house, a home. Thanks Faye – sorry I had to hang up on you so quickly last night – too much chaos going on all at once! We miss you two! This soup rocks! I always am asking Lisa to make this soup, even in the summer. It is very flavorful and light. Powered by Copyright © 2013 Lisa Orwig All Rights Reserved WordPress and Sliding Door theme.